Danielle - CAYK Marketing Inc. If you’ve called into CAYK within the past few years, there is a pretty good chance you’ve spoken with Danielle. She comes to us with an amazing background in a fast-paced and demanding customer service role. Each day in her former career required her to be quick on her feet, creative, tackle problems, and work on a multitude of projects at once. Danielle joined CAYK Marketing back in January of 2016 and has been a great addition to our team! 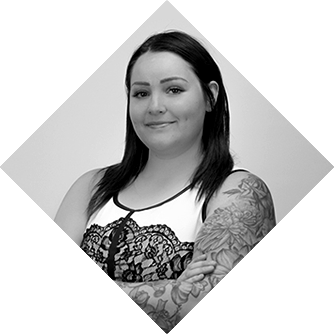 You’ll find Danielle in our Calgary office, managing not only our office but also our programming, design and writing teams. Like many of CAYK’s team members, Danielle also wears many hats including heading our Website Design & Development department, Facebook Advertising, Google AdWords, Search Engine Optimization, Management of our Writers, and is head of our social media department. If you’re a retained marketing client, it’s likely you’ll see her at all of your account planning sessions, making suggestions and assigning tasks.